Lomani Island Resort shimmers with elegance, a boutique adults only Fiji resort created especially for lovers. Speaking of which, “Lomani” is Fijian for “love”. Set in the gorgeous Mamanuca group of islands, Lomani Island Resort has all the trimmings you’ll fall in love with too: tropical gardens meticulously cared for under the towering coconut palms of the Malolo lailai island, miles of white beachfront sand, pristine lagoons, and crystal clear waters gently lapping at a mesmerizing shoreline. The island was once home to a copra plantation, which explains the abundance of palms, frangipani, hibiscus and bougainvillea flowers. Raise your sights morning and night and you’ll soak up stunning sunsets and sunrises that elegantly frame the sky. Glide into the ocean only footsteps away for bursts of exotic colours in the tropical marine life and coral. And allow yourself to float into the bewitching charms of tranquility and calm that emanate from the beautiful resort facilities. Looking for a dream honeymoon destination? An escape for lovers? Or a retreat for those flying solo to catch some “me” time to recharge. Luxurious yet affordable. Modern yet authentic. Laidback yet meticulous. Lomani is everything a beautiful Fijian resort should be. An adults only Fijian resort where rejuvenation is promised and memories are made. We guarantee a tranquil and romantic atmosphere ideal for those on a Fiji holiday seeking total relaxation. Love Fiji, Love Lomani. 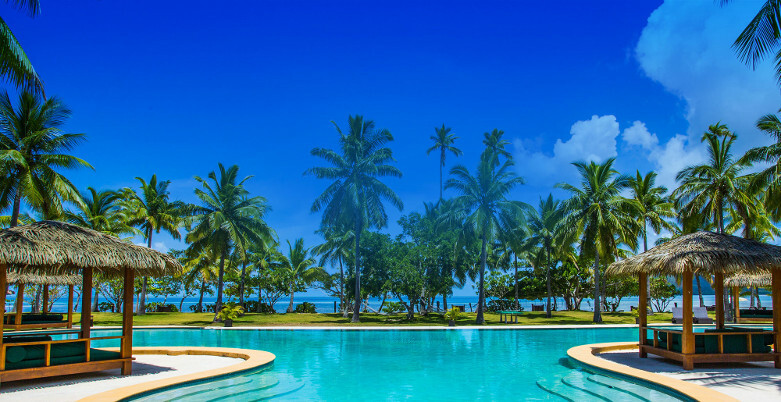 Love the adults only Fiji resort vibe of Lomani Island Resort.